Audi’s all-new, all-electric SUV, the 2019 E-Tron, will be the first electric offering from the automaker with a starting price of $74,800. It’s a considerable amount of money, even for a luxury car, and Audi has plans on how to best sell it. Unlike for traditional cars, Audi dealers won’t have a fully stocked inventory of E-Trons sitting on their lots, waiting to be sold. Instead, dealers will handle the refundable, $1,000-deposits from customers wishing to reserve a car and then deliver the car to them that way, reports Automotive News. 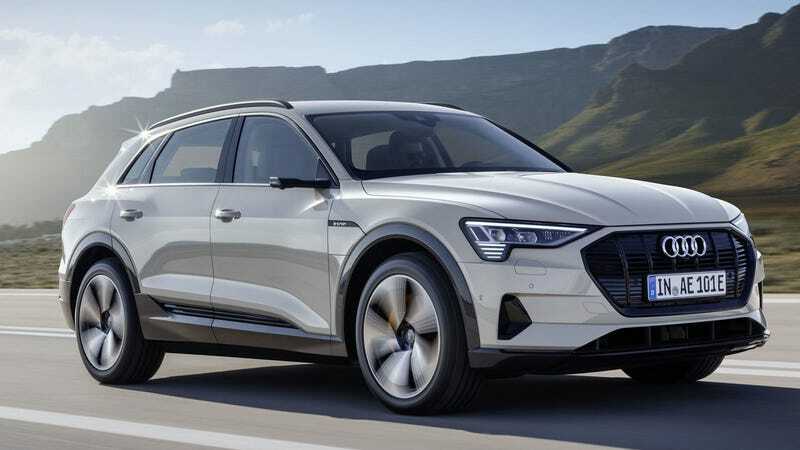 ... every Audi dealer will be able to sell the e-tron without having to worry about allocation or whether the factory got its sales projections for each dealership right. Reservations and deposits can be made online through audiusa.com or in person at a dealership. That would cut down on a lot of back-end costs for Audi dealerships. And it might actually help Audi and its dealerships do something that most car dealerships historically haven’t been able to do: Sell electric cars at a profit. Or really, show much interest in selling them at all. It’s expensive to keep a full inventory of cars on a dealer lot, especially when it’s an inventory of electric cars. Many people still aren’t ready to make the jump to an EV yet, and many dealers don’t do a good job of selling them to people because the tech is unfamiliar and requires learning a new sales pitch. Both of these factors contribute to a much lower guarantee of a sale. As a result, EVs aren’t the cars dealers want sitting on their lots and it would be much more profitable to make them to order. What would likely happen is that an Audi dealer would have one or two E-Tron show models for people to look at, sit in and test drive. Audi still needs to connect people to the car through its dealerships. But when it comes down to actually buying the thing, a customer would have to order it. Keogh said the time a customer waits for delivery will depend on global demand, and it could stretch for months or even a year or more. All e-trons will be built at Audi’s assembly plant in Brussels. It’s true that with this new system, a customer probably wouldn’t be able to drive home in their new E-Tron that same day. But the car is a luxury vehicle, and a pricey one at that. Generally, buyers who are looking for cheaper cars are the ones who drive off in one of the ones from the dealer lot. Luxury buyers who are dropping serious cash usually prefer to customize their cars. They expect the wait. Also, I don’t see Audi stopping a dealership if it wants to suddenly order a couple E-Trons for the floor, even if it doesn’t have those customers lined up. I think this new model is an option, and if a specific dealer is particularly adept at selling electric cars, then it can choose to do order more. This whole thing feels like Audi testing the waters for selling EVs. It isn’t going to commit to a full dealership inventory yet, but if, over time, interest in the cars grows and both sellers and customers get more used to the idea of EVs, then maybe it will start using the more traditional method. But, for now, this definitely seems like the most profitable route.